Who says the age of chivalry is dead? Probably people who don't live in the magnificent Lionheart Castle from Le Toy Van! Perfectly scaled for Le Toy Van's Budkins Knights, or any other figurines around 10cm tall, Lionheart Castle is sure to be the scene of many valiant adventures. This statuesque castle is the largest in the Le Toy Van range, and with so many features and play options, it's a set that will never fail to entertain or delight. Lionheart Castle has a real presence about it - play rooms and bedrooms look amazing when it's a part of the furniture. 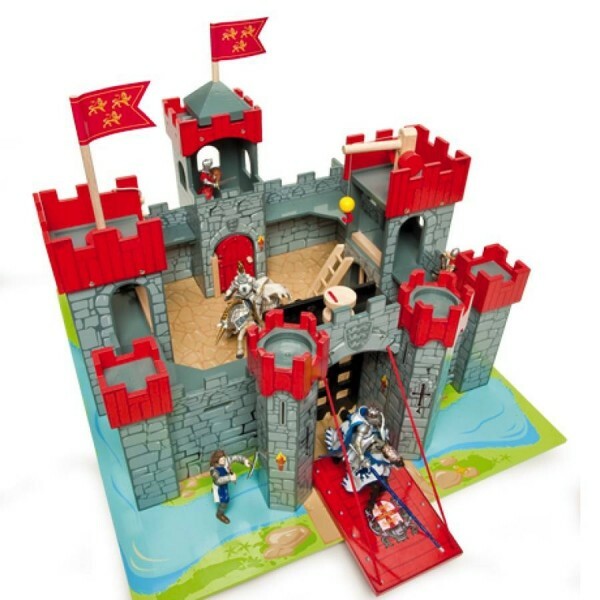 With moving draw bridge, a working winch and prisons with lifting doors, there's enough exciting movement and action to keep any little Knight entertained for hours.